Despite the restrictive advertising rules of the major online advertising players, you can still list your cannabusiness in local directories. Are you in as many places as you could be? This article will help you make sure your customers can find your dispensary or retail location. There is a lot of gray area in the green business—especially when it comes to marketing. As we’ve covered in a previous post around the difficulties in advertising on Google and other outlets, the terms and conditions of Google Adwords, Bing, Facebook, and Yahoo prohibit ads for marijuana-related products and services. Yet many dispensaries show up on Facebook, Google Places, Google My Business, and Bing anyway. What gives? It’s all about how you list your business. By carefully following the ad giants’ own rules you can make sure your dispensary or store is found. This includes choosing the right category and keywords as we will explain below. This can be a little time-consuming, but the effort will pay off. Google My Business is the first step in getting your site listed in these areas on Google. On the left side of this graphic is the 7 pack. The 7 pack is a list of the 7 most relevant local businesses that Google decided best answered a search. These 7 are determined to be relevant based on search term (query), where the search was made from (proximity), reviews of those businesses both on Google and on other respected sites (citations), signals from the company’s website, and several other factors that can take us on many other tangents. To start, simply filling out your local profile in Google My Business as completely as possible will help you on your way. The map on the top right is an extension of those listings and helps users visualize where the businesses in the 7 pack are located. To many advertisers’ dismay, this map will actually cover up paid advertisements as you scroll down the page. It is essential that you choose the right category and keywords. For example, Google Places has an “Alternative Medicine” category that pulls in keywords such as “medical marijuana,” “medical cannabis,” “cannabis clubs,” “medical marijuana dispensaries,” and the like. It seems to contradict their own rules, but works nonetheless. The same is true of Facebook and Bing. Other sites that show businesses but not categories include Kudzu, Superpages, Local.com, and Manta. But those aren’t the only places. Below are directory sites that have actual categories for marijuana-related businesses. And all of them allow free business listings. 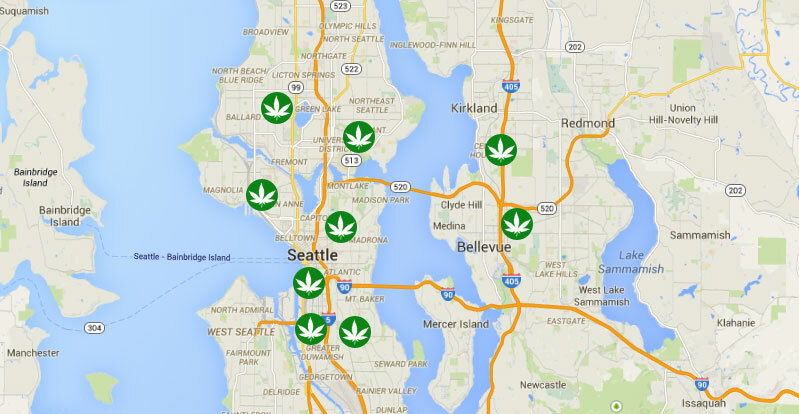 Below are 15 of the most popular marijuana dispensary directories you should consider using. This isn’t a comprehensive list of directories, but does provide a good start. There is a lot more you can do. Here’s a quick list of other things that can help you with local search. Get real reviews and citations. Getting these on social and directory sites builds trust with your customers. Don’t fake these! Never pose as a customer or pay for positive reviews, either by offering coupons or anything else in exchange for favorable reviews, or by hiring others to post reviews on behalf of “customers.” Not only is this poor practice, it can hurt your business. What you want are genuine reviews from satisfied customers. Those speak volumes. And you don’t necessarily need the highest number of reviews. You just need a steady increase in good reviews. You can certainly ask customers to post reviews if they are happy with your product and service, but don’t be pushy. If they like your business they will likely be willing to do it. Plus, positive reviews will help you build a good reputation in the industry, opening you up to a much wider audience. But be patient. Building trust takes time. Link from your website to some of your profiles and vice versa. This connects users to your profiles, builds trust, and gives customers a place to post their reviews. And be sure to consistently post quality, informative content on your site. This will keep them coming back. Mention your profiles from your social accounts. Let people know how to find you. Again, you can encourage people to post positive reviews and show them where to do so. But do it in a friendly and honest way. Give them a reason to engage with your social accounts by giving them good, entertaining, and informative content. Check out Yabaseo’s website. You will find more tips and general information about improving your local search, SEO, and other business essentials. Or better yet, give us a call to discuss your specific needs. Always remember that building a business is a slow and steady pursuit. But by taking the time to accurately list your business in as many local directories as possible, you’ll develop the infrastructure for long-term success. The effort you put in now will be worth it.